Instant Pot Mashed Potatoes are so fluffy and creamy! Cooking the potatoes in an electric pressure cooker steams them to perfection, makes them taste more flavorful and saves time. These smooth mashed potatoes are ready to eat in under 30 minutes! Pressure Cooker Mashed Potatoes are fluffy, creamy, perfect, and so easy. Infused with roasted garlic or parmesan if you want to go to the next level or made simply with butter, these mashed potatoes will be your favorite side dish. 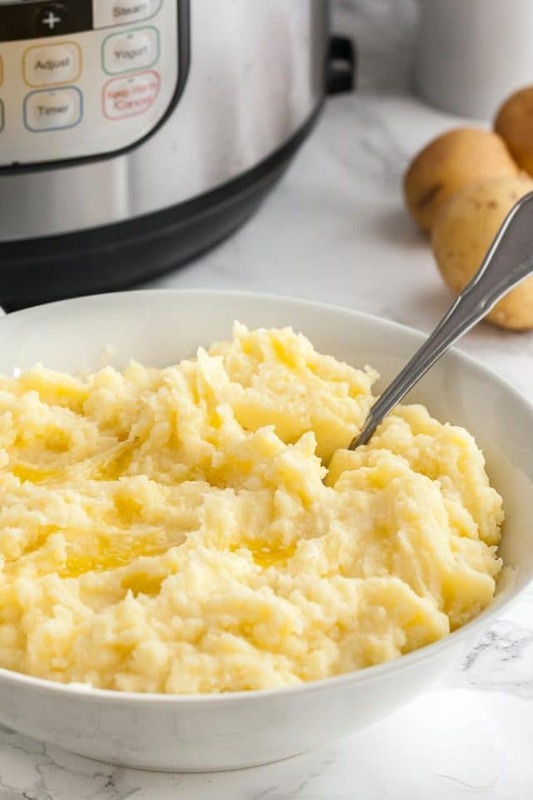 Mashed potatoes taste heavenly and are really easy to make in the Instant Pot even if you aren’t a pro in the kitchen or a new Instant Pot owner! 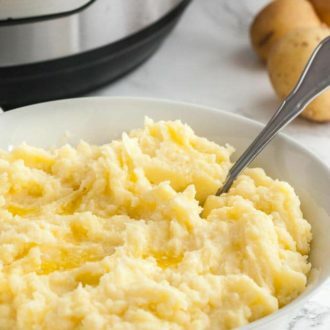 Using the Instant Pot to cook the potatoes cooks them faster and because they are steamed rather than cooked in water they taste much more flavorful and the mashed potatoes will be fluffier. These Instant Pot Potatoes make a great side dish for special occasions like Thanksgiving, Christmas, or Easter but are also easy enough to make during the week. My family loves them together with a roast, some bratwursts (and sauerkraut), or with a perfectly cooked steak. Cooking the potatoes in the Instant Pot results in a great texture and a more flavorful taste. Instead of half and half, you can also use the same amount of milk to save some calories. Russet potatoes are my go-to potatoes for mashing. You can use unpeeled potatoes if you prefer. Serve these mashed potatoes by themselves or topped with gravy or your favorite mix-ins.
. Turn on the “keep warm” setting and stir occasionally. Which are the best potatoes for mashing? It’s a matter of taste. The best potatoes for mashed potatoes are high-starch potatoes like russet potatoes. They mashup fluffy and light, and absorb the butter and half-half. I prefer using Russets because I love the texture. 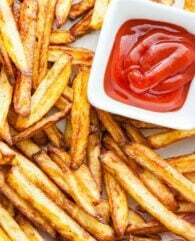 But Russets are the most mildly flavored potatoes, so to get more potato flavor you could use half Russets, half Yukon Gold. What is the best tool to make fluffy mashed potatoes? 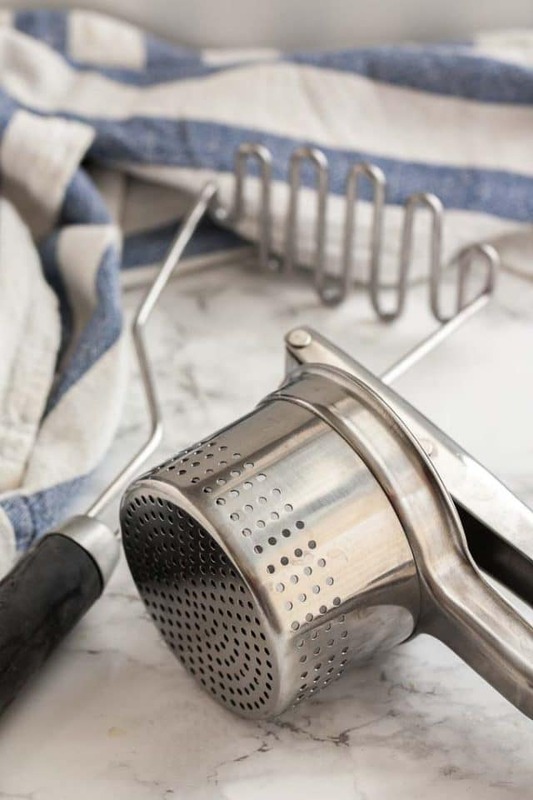 Potato Masher: The classic mashing tool! A masher should be your choice if you like a more chunky, textured mash that’s especially good when adding extras like herbs. a masher should be your choice. Stand mixer: Many people use a stand mixer to mash potatoes. You just need to be careful not to overwhip the potatoes. Food Processor: The blades of a food processor will actually tear the starch molecules. The released starch mixes with the liquid in the cooked potatoes and the mash gets sticky, pasty, and gluey. I love this one! It has soft handles and hooks on any size of pot or bowl. This makes ultra fluffy and smooth mashed potatoes. that comes with Bluetooth so you can program and monitor the pot from your phone. 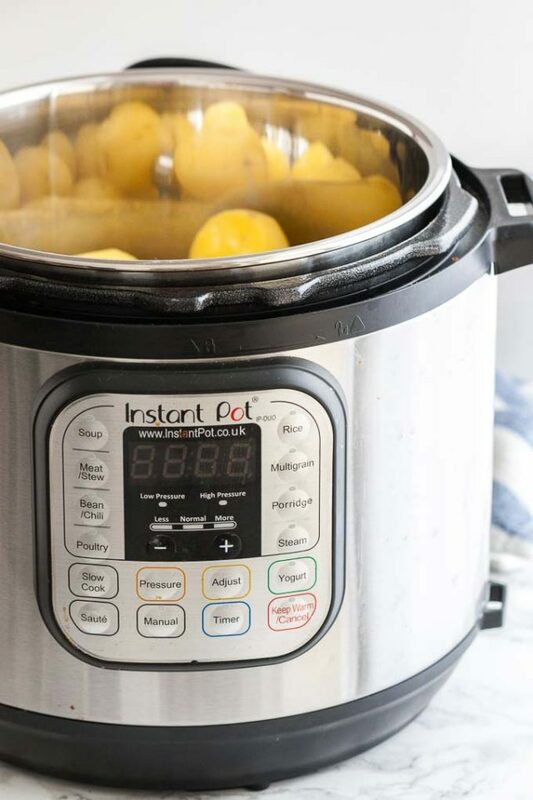 This is a great gadget to have if you own an Instant Pot! 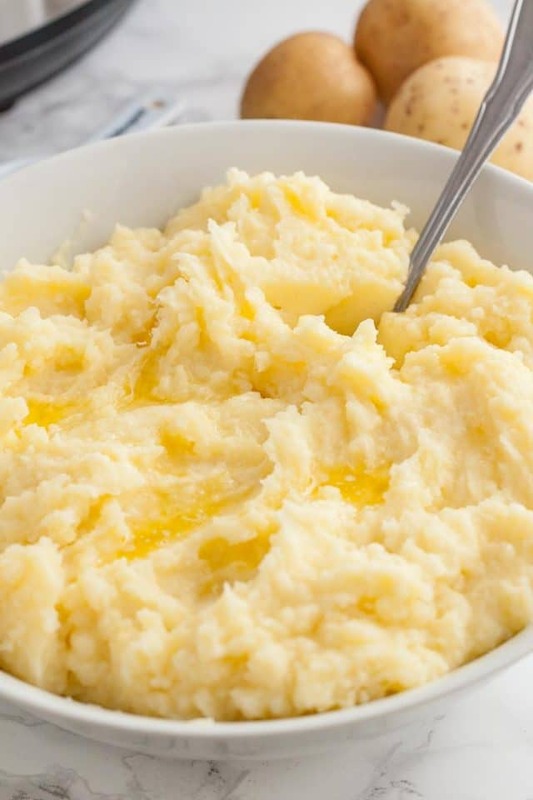 WANT TO TRY THIS INSTANT POT MASHED POTATOES RECIPE? PIN IT TO YOUR SIDES BOARD TO SAVE IT OR SHARE ON FACEBOOK! Fill the pressure cooker with 1.5 cups cold tap water and place the trivet or a vegetable steamer in the pot. Add potatoes on top. Close the lid and pressure valve. Cook on High pressure for 7 minutes, then let the pressure release naturally for 10 minutes before doing a quick release. In the meantime, melt butter in a small saucepan then add half-and-half. Remove from the heat when hot. 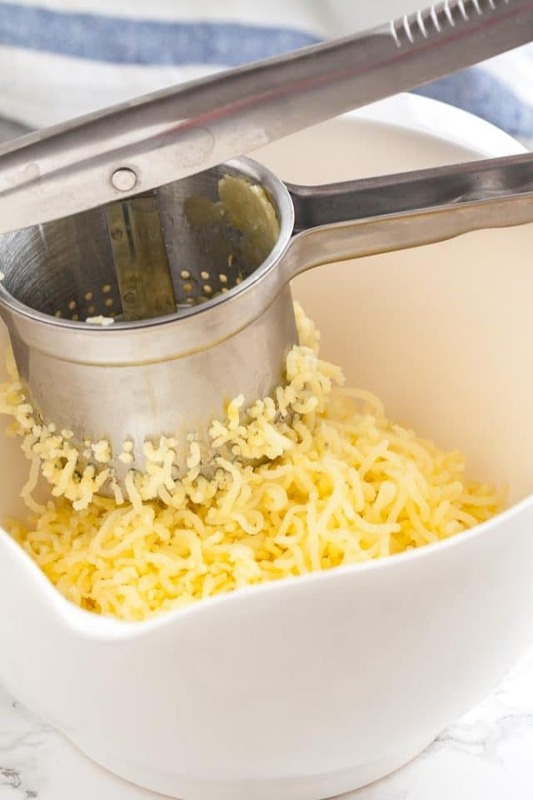 Remove potatoes from the pot and mash with a potato ricer (or masher). I don't recommend using a food processor or blender! 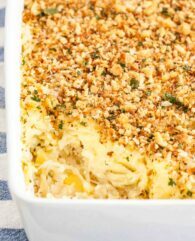 Add butter mixture, salt, and parmesan cheese and gently fold in with a rubber spatula until absorbed and potatoes are thick and creamy. Adjust seasoning. 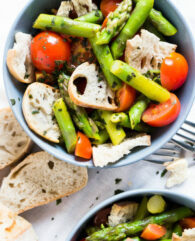 Serve sprinkled with parmesan and black pepper.